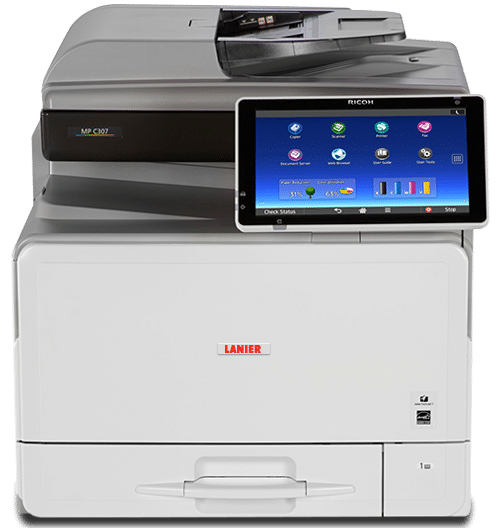 The Lanier MP C307 Color Laser Multifunction Printer is made to accelerate workgroup productivity and lower costs. This color MFP has all-in-one print, copy, scan, fax, local storage and cloud capabilities! The MP C307 becomes your workgroup’s information management hub. Your print and digital documents come together to help streamline collaboration and more. This Lanier MP C307 Color MFP impresses your clients with brilliant colors! You can produce crisp and clear images in color with a resolution of 1200 x 1200 dpi. There are many features to help create great business designs and adjust color settings to help create vivid designs to make your clients come back wanting you do design more for them. This printer comes with a 1.46 GHz processor which makes it easier to upload large files at a quicker speed. The Lanier MP C307 Color MFP is also fast enough to handle more than one job at a time. Work more efficiently by embracing the mobile printing feature and using the cloud to store and print files. This printer has a tablet-like screen on it to make use very easy. It has apps and features just like your smartphone, so you’re already familiar with how to operate it. Want to know more? Give us a call and we’ll help you with finding the copier you need for your business. We are authorized and have been selling copiers for 10 years and we would love to help your company!